Crafted by the finest team of news professionals, Challenges offers an in-depth perspective into Haiti’s reality like no other magazine, coupled with a thorough look into: politics, economy, society, culture and sports. Challenges, a pioneer in its genre, began as Haiti’s first and only weekly news magazine for over a year before it switched to a monthly magazine in order to offer readers deeper analysis and more investigative pieces. This fresh new source for reliable and timely news available to the public at large, has been catering to savvy readers since August of 2015. A relevant source of information concerning Haiti, the Caribbean and the world, Challenges attracts the attention of some of the greatest minds with its unique content unavailable anywhere else. Not only is this new medium attractive with cutting-edge design for comfortable reading, but it also boasts rich, relevant and stimulating reads. In addition to an aggressive national circulation in Haiti, Challenges pages touch Haitians around the world in both print and digital form. The magazine’s multi-tier approach to print and digital issues alongside various social media channels guarantees immediate and constant interaction with its discerning audience. Fresh, reliable, progressive, objective, thorough, focused, current & targeted. 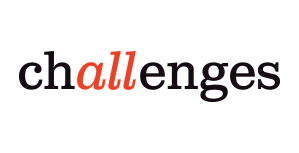 Challenges is news you can trust.